Former president Bill Clinton must be a gourmand because he sure likes to go to tasty restaurants. One of these restaurants is The Slanted Door in the Ferry Building in San Francisco. I found this place after doing a googling for vegetarian-friendly eateries near the Financial district. The menu for the restaurant made it seem Asian-inspired, which made me a bit worried after trying a few too many bad fusion spots, but the reviews were good so I went anyway. 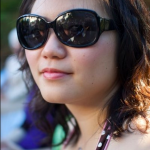 First off, The Slanted Door is not a cheap place. Although the waitress had mentioned that they serve family-style where everyone can share everything, the portions were single-portion-sized and the prices were high. The good news is that most of the food is decent if you’re not too critical of their take on ethnic foods. The BF, our dining companion and I all were fairly pleased with the meal. We started with rice flour dumplings stuffed with a chopped peanut filling. The filling tasted like a dry, gritty peanut-butter, which isn’t bad, but is strange. 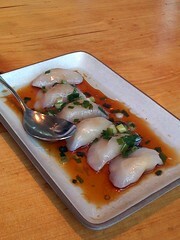 The skin of the dumplings were sticky, chewy, and satisfying. I’ve had better, but this was pretty good. I especially liked the citrusy sauce it came with. 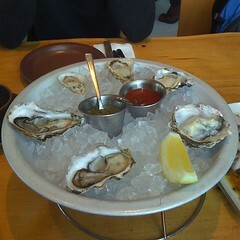 I ordered a half dozen oysters on a half shell, which took longer than I thought it should to arrive. All of them were fresh and delicious with that wonderful ocean taste. Our dining companion was more of a fan of gulf oysters which I’m told is sweeter but unfortunately weren’t available at The Slanted Door. 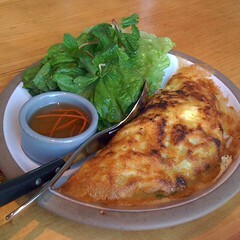 Next, we shared the the banh xeo. I believe there’s a vegetarian version, but we ordered the one with pork and shrimp. This was cooked expertly with a hot, crispy outside. The pork was a bit dry and overdone, but the shrimp was okay. I’ve been so used to eating the vegetarian version that I was surprised when I had a mouthful of meat in one bite. The meat doesn’t really add much to this dish though, so I’ll probably keep getting the vegetarian variety. 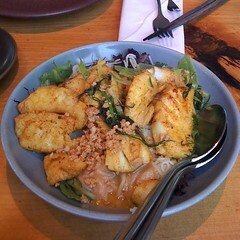 The main for the omnivores was turmeric fish with rice noodles tossed in a pineappple and anchovy sauce. The fish, halibut, was way overdone, but at least it was spiced well with turmeric and dill. The sauce was quite tart and sharp, which I really enjoyed. I just wish that the fish wasn’t so overcooked that it resembled dry chicken breast. What a waste of a perfectly good piece of fish. The BF ordered the hodo soy beanery organic tofu. We were pleasantly surprised to find that it had two different types of tofu: baked and fried. 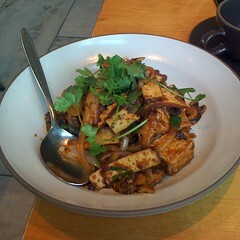 The dish was bold in flavor with lemongrass and soy, which is great for those who are scared of bland tofu. We also ordered a dish of stir fried young broccoli, but it was kind of a let down. Anyone can stir fry broccoli with garlic and maggi sauce and charge $10 for it. Now that I’ve written my thoughts down about the place, maybe it wasn’t as good as I thought. I do remember leaving it, thinking, “Hey, that was pretty good!” but maybe it was just not as bad as I had feared it would be. The restaurant is right on the water with large windows everywhere; perhaps the nice ambiance swayed my opinion of the food. Overall, the restaurant didn’t try too hard to reinvent ethnic dishes but rather just tried to make good food period, which I have to give them credit for. I think the dumpling filling was supposedly mung bean. Not sure if there were peanuts in it too… agree that the texture was weird.